We are your case sealing partner – with a vested interest in your case sealing success. 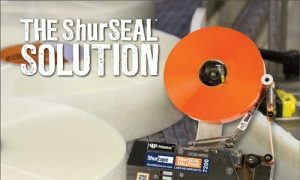 The ShurSEAL solution combines Shurtape HP Series packaging tape with a PrimeLoc tape applicator for better carton seals and packaging line efficiency. To learn more, click here and read our February newsletter! Contact us to schedule an evaluation of your case sealing equipment – our team will identify potential issues and solutions, demonstrate how the ShurSEAL Solutions can deliver secure seals, as well as review potential cost savings that could be achieved by switching to the ShurSEAL solution.